Curb appeal – While soffit and fascia boards are designed to keep the elements out of your home, they are an exterior finishing detail and have a huge visual impact on the property. While replacing or re-cladding soffit and fascia, take the opportunity to look into different colours. Increased curb appeal is always a benefit to you and your home. Ventilation – Much like the vents at the peak of your roof, a properly ventilated soffit opening is essential for prolonging the lifespan of your roof and maintaining proper temperatures within your home. Older homes with wooden soffits usually lack ventilation. 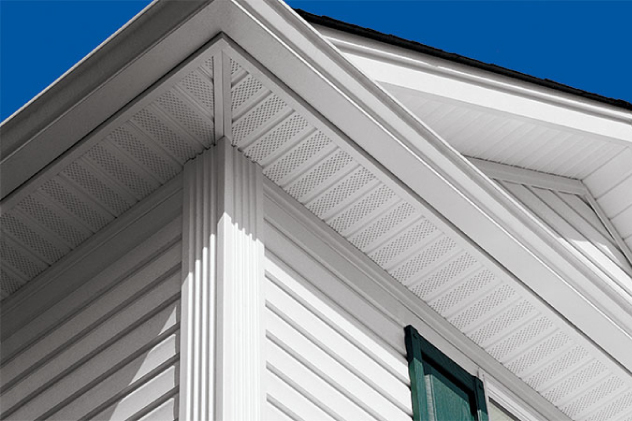 Our trained team will replace your wooden soffits with a vented aluminum cladding and fascia to match, making sure that your attic is breathing the way it should be. Pest Control – Old wooden soffit and fascia boards are no match for the animals native to the greater Ottawa area. Squirrels, raccoons, bats, and insects love nesting away from the elements. Any broken, saggy, or improperly installed boards leave openings for these critters to find a new home in your attic. Installing aluminum soffit and fascia coverings with appropriate caulking ensures no animal will be able to enter your home, reducing the risk of further roof damage.